Developing your own proprietary video platform can cost hundreds of thousands of dollars. Or, you can host your videos on EZWebPlayer’s White Label Custom service and have the APPEARANCE of owning your own video platform for just $99.99 per month, or even less with a 10% discount. EVERYTHING on White Label Custom can be custom domain branded with your domain name: your video playback URL, your video channels, your landing pages, your player itself, your live streaming videos, and with White Label Custom even your administration console. What's more, because ONLY your name, domain name, logo, and brand appear with White Label Custom hosting, it looks to all the world like you own the video platform. Why’s that important? Because it increases your credibility and underscores your prominence in your marketplace. It shows that your company is a serious player who has the capital and resources to build and support its own video platform. While your viewers are watching videos on your branded company players, your competition is still stuck using industry branded players with third party logos on them. Create your branded header & footer today! Brand your login page as your own today! 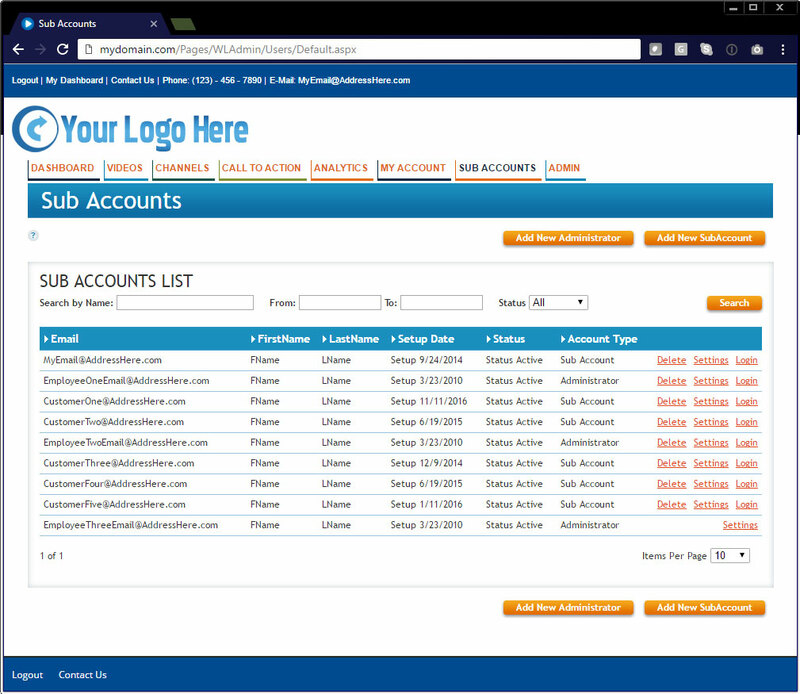 Use EZWebPlayer White Label Custom to add value to your existing service by providing video hosting to your clients using our Sub Account feature. This allows you to provision user accounts to your very own video platform and make money by reselling video hosting or simply adding value to your existing clients. So if you want to build credibility, host your videos on your own proprietary platform. And if you want to own your own video platform without paying $100,000+ or more to develop one, sign up for EZWebPlayer’s White Label Custom service. Get all the custom branding advantages of a proprietary video hosting site for just $99.99 a month, or even less with the 10% discount. Brand your sub account's activation email.